Is Part-Time Work the Wave of The Future? Here’s an unorthodox policy move in the midst of a recession: Tell businesses to create more part-time jobs. The British government has recently unveiled a series of initiatives to bolster part-time work, including urging employers to post full-time jobs as part-time or job-sharing arrangements, as well as creating a national data base of part-time jobs. In a particularly bold move, the British government is also considering extending flexible working laws — which allow employees to ask their current boss if they can reduce their hours — to future employers as well. Today I’m over on PoliticsDaily.com talking about why this may be smart economics and smart politics…and why it may also make women happier. I was delighted to have my article about delaying the start of schooling featured on the New York Times Motherlode blog last week. Motherlode is a superb website for parents of children all ages, which combines personal essays, policy analysis and good old-fashioned reporting. If you’re looking to read a parenting blog, go no further. 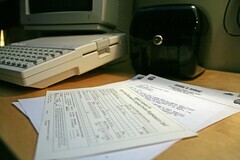 Image: Registration by Dansays via Flickr under a Creative Commons License. Yes yes yes! The more flexible work arrangements can be the better — but that means the issues of financial need, benefits, etc., etc., must also be addressed.